Volgograd: ‘Uchitel’ Publishing House, 2011. Social phenomena and processes can be analyzed in various ways. The method of studying certain dimensions or cuts of social reality is hardly the leading one among them. This is especially the case when a study is connected with long historical periods. In the present monograph just this particular method is applied (of course, alongside with many others). Here some macrohistory trends and aspect of globalization are considered in tight interconnection. Macrohistory is history on the large scale that tells the story of the entire world or of some major dimensions of historical process. For the present study three aspects of macrohistory have been chosen. These are technological and political aspects, as well as the one of historical personality. Taken together they give a definite picture of unfolding historical process which is described from the beginning of human society formation to the present day and near future. 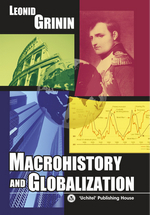 The combination in the monograph title of the two terms – macrohistory and globalization – is in no way artificial. On the contrary, the connection of these terms is organic at least as the real goal of macrohistory is to find meaning in the past so as to create new possibilities of meaning for the future. The analysis of globalization also includes three aspects: political, economic and futurological as today the world may well be regarded as being at the start of a new global reconfiguration. The author presents his ideas of the world prospective political and in some respects social-economic development basing on the analysis of macrohistory and contemporary globalization processes. The monograph also considers some global scenarios of the World System's near future.